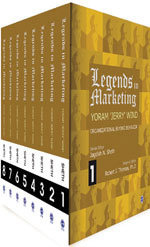 Yoram 'Jerry' Wind is the Lauder Professor or Marketing; Academic Director, The Wharton Fellows Program; and Director, SEI Center for Advanced Studies in Management at the Wharton School of the University of Pennsylvania, USA. Professor Wind is one of the most cited authors in marketing. He is a regular contributor to the professional marketing literature, with 22 books and more than 250 research papers, articles and monographs on marketing strategy, marketing research, new product and market development, consumer and industrial buying behavior and international marketing. He is the recipient of numerous academic awards, including the four major marketing awards: the Charles Coolidge Parlin Award (1985), AMA/Irwin Distinguished Educator Award (1993), the Paul D. Converse Award (1996), and the Buck Weaver Award (2007). His 2004 book, The Power of Impossible Thinking: Transform the Business of Your Life and the Life of Your Business, draws on the latest research in neuroscience to explain how a person's mental models can distort perceptions, creating both limits and opportunities. He consults with major firms around the world, provides expert testimony in many intellectual property and antitrust cases, and has lectured at over 50 universities worldwide.